Jason Kenney has expelled a member of the United Conservative Party who has a history of anti-Semitic and racist comments, as the fallout continues from Ricochet’s investigation into a white supremacist web store run by a group that includes four active members of the Canadian Forces. Adam Strashok, who ran the call centre for Kenney’s campaign for leadership of the UCP and used to work for Conservative MP Bob Benzen, is also no longer part of Fireforce Ventures, the company at the heart of this week’s disclosures. A profile of Strashok was released by Press Progress on Tuesday following up on Ricochet’s reporting. It provided more evidence of both his affinity for the far right and his close ties to Kenney and the mainstream conservative political movement. 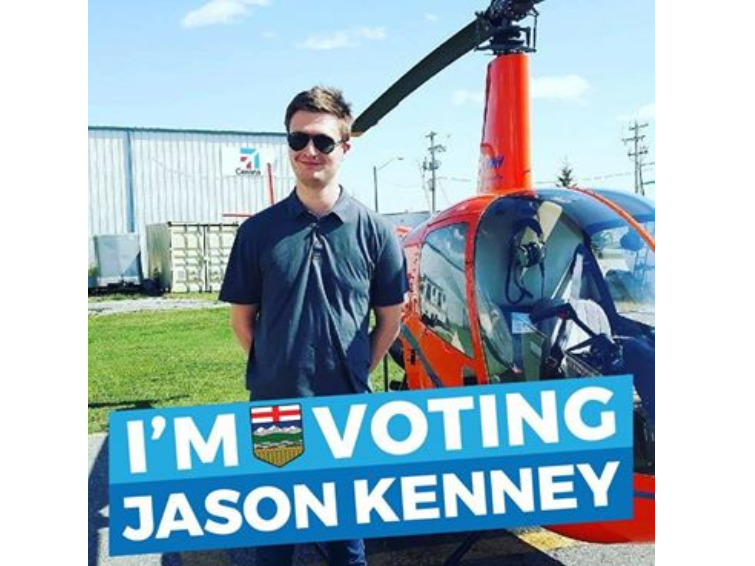 A 2017 profile picture from Adam Strashok's Facebook account has a frame that says, "I'm voting Jason Kenney." He came under fire on Twitter for failing to mention in the lengthy statement that Strashok had held a senior position on his leadership campaign, and for dedicating the bulk of the statement to self-congratulatory references to his own track record. Your actions don't always match your fine words. Cozying up to Rebel Media. Niqab ban. Votes against equality rights. Grandstanding on the wrong side of protections for women and children. Lying - the frequent, irritating lying. This statement fails to even acknowledge that *you* hired this man for over two months on your leadership campaign. Fireforce Ventures released a statement on Facebook on Oct. 30, 2018, announcing the departure of Adam Strashok. The maelstrom enveloping Kenney is an example of the dangers of tolerating the far right within mainstream political movements. The Strashok revelations come on the heels of a number of scandals involving UCP nomination candidates, several of whom were photographed with members of the Soldiers of Odin at a recent nomination meeting. Kenney has come under fire from Premier Rachel Notley and other critics for dog-whistling to the far right, and failing to emphatically denounce supporters with extreme views. Earlier this year a UCP candidate was disqualified for anti-Islamic comments, while another one-time candidate apologized last month for comments opposing the opening of a mosque. Another nomination candidate was allowed to run despite having made homophobic comments on social media. Critics note that Kenney has responded to scandals around his candidates with dry statements on social media and has refused to conduct interviews or denounce them on camera, possibly leading those with extreme views to believe they have a place in his party.